We caught up with our friend Murray recently over lunch at Good One BBQ in Victoria Park. 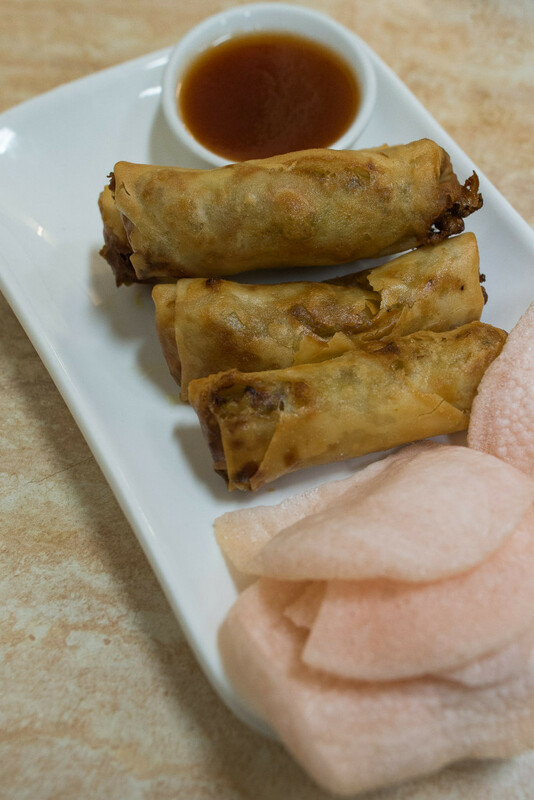 Spring rolls aren’t listed on the lunch menu, but Murray had a craving and for this bona fide Chinese restaurant, frying up some spring rolls for lunch was no problem. We were initially a little taken aback when they arrived, however – they were the gnarliest, ugliest spring rolls we’ve been served in a Chinese restaurant. They looked like the sad old leftovers from a lunch bar bain marie, sitting next to the shriveled fried dim sim which only the most desperate person with the munchies would buy, but we were surprised, because boy, they were tasty! The prawn crackers however, belonged in the bin with my imaginary fossilised dim sim. They were stale and rubbery – the only blip in an otherwise satisfying meal (no, the beaten-up spring rolls were not a blip). 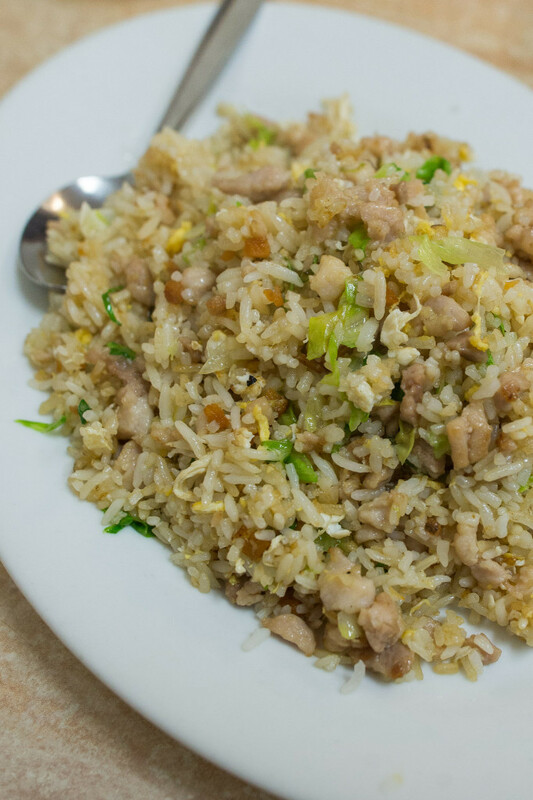 The salted fish and chicken fried rice(AU$13) is moreish and highly recommended. You can see and really taste the tiny pieces of brown salted fish. 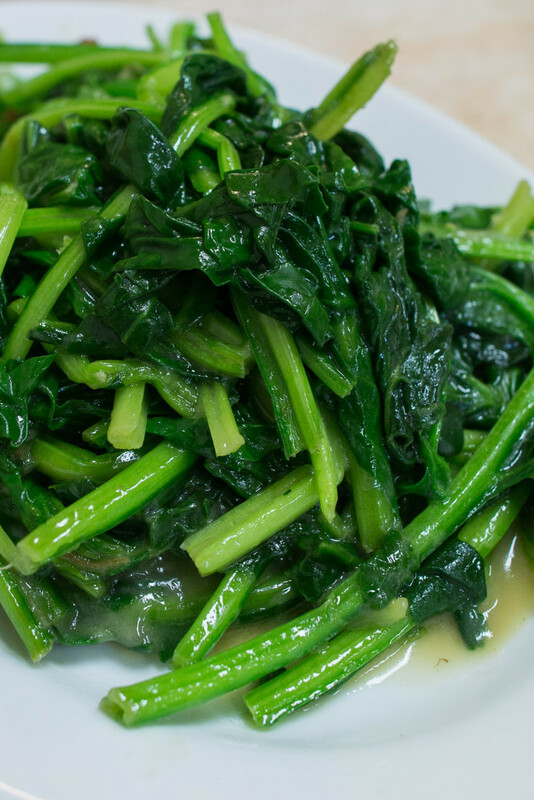 The spinach with chilli and bean curd sauce (AU$11) is a very home-style dish with no frills – actually, that’s the case with all the dishes – just a plate of juicy, vividly green leaves and stalks. I could taste the chilli but I’m not sure where bean curd came into it. 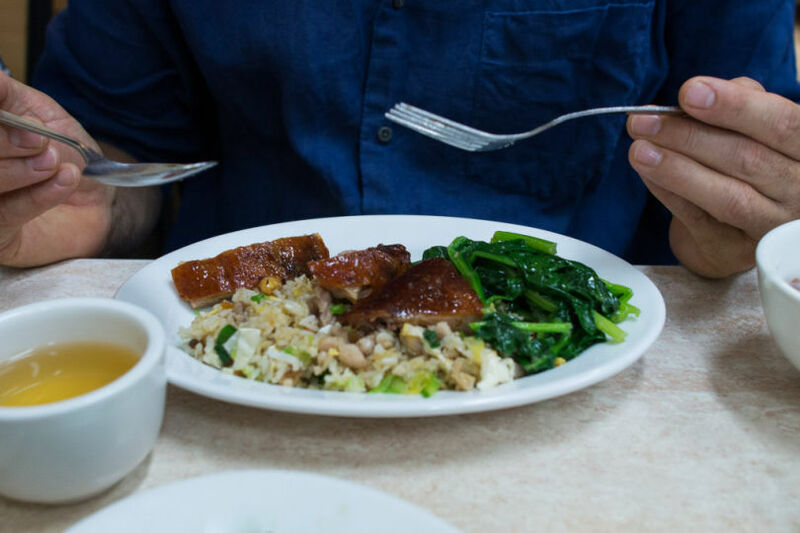 We shared a bowl of roast duck rice porridge (AU$10.50), which contained a decent amount of duck meat and skin and had an excellent consistency. It was Murray’s first encounter with Chinese rice porridge and he loved it, going back for more. 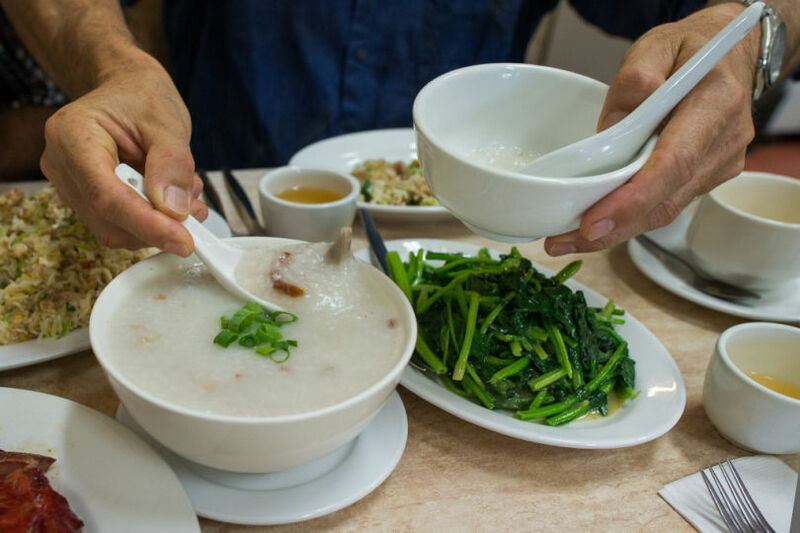 I’ve been spoiled by my mum’s porridge which is always well salted, cooked with meaty bones and homemade peppery pork balls – Mum’s is still the best – but a sprinkle of pepper and drizzle of soy sauce into this duck porridge and I was pretty happy. We find it difficult to choose just one, two or three of the BBQ meats, so if there are enough of us to eat them, the best option is “The lot” for $30. 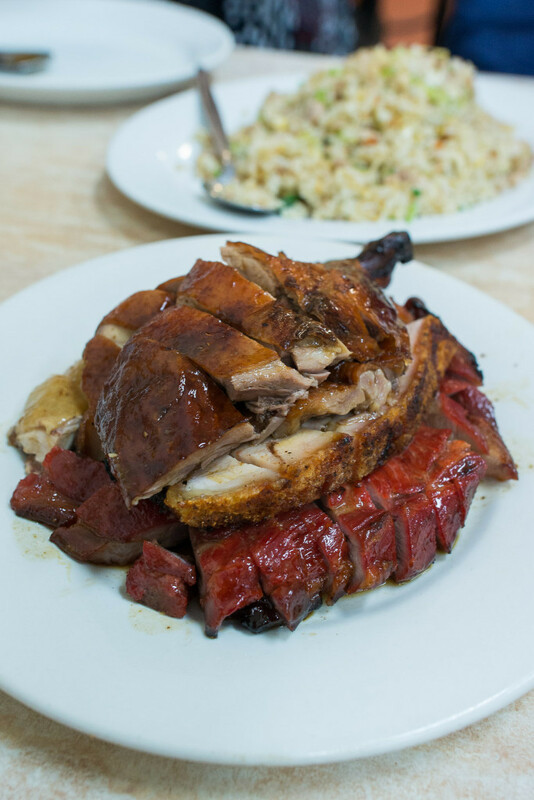 BBQ pork, roast pork, roast duck and roast chicken, all shiny and succulent, chopped to order by a cleaver-wielding, toque-wearing chef at the front of the restaurant. 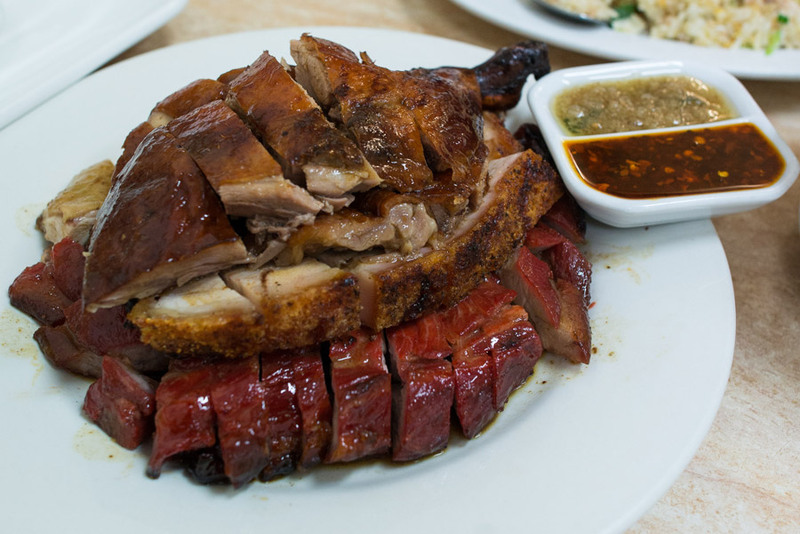 It’s laid proudly on roasted peanuts, stacked neatly to form a meaty tanker, served with ginger sauce and chilli oil. 1 2 3 4: which meat do you choose first? In addition to craving spring rolls, Murray was in a roast duck place that day. Me, I always go for roast pork first. After eating my share of the meat tank I tend to feel a little remorseful – I grapple with similar feelings after I’ve just eaten KFC – but the once-in-a-while pleasure is worth the guilty, I mean greasy lips. Another good one! Yes, I’m referring to the meal, not that joke. See my previous post on Good One BBQ Chinese Restaurant.